The engineering team at Football Play Card has been hard at work updating our application to take advantage of the latest technologies to help you, our coaches and players, save more time while preparing for practices and games. Over the past two years, we rewrote the underlying architecture of our app, so that we can deploy and run our app using the latest server and database technologies. This allows us to build and release new features faster as well as scale up during peak usage. In addition, we have been working with our NFL and NCAA teams to add enhancements that ensure our app meets their speed, performance, reliability, and security needs. What does this mean to you… even if you have thousands of plays, play cards, folders, and play scripts, your plays will load instantly. To kick off the spring football season, we just released the first of many features that are currently in development for the 2018 season. Many of you have asked for the ability to download and print your play scripts, and now you can. To download your play script, simply navigate to the Folders & Play Scripts screen, select your play cards, and select the Download Script button. You can then view and edit your play script and then print your play script for practice or turn it into a play band for your players. 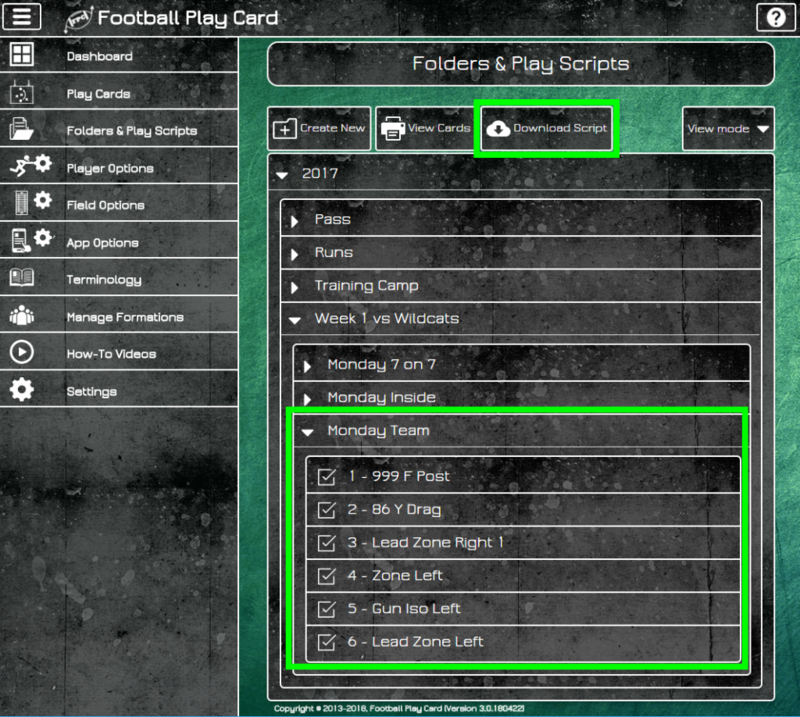 Log in now at FootballPlayCard.com to create and download your play scripts and to check out all of the latest features and enhancements. This new functionality will be available in the iOS and Android mobile apps soon. This entry was posted in Football Play Card News, New Functionality and tagged Football Play Card, Football Play Script, Play Scripts, Print Play Script. Bookmark the permalink.